This battle will require the usual 3 mods, KS Sprites, 1.02, KS SOW Supplemental maps 1.09 and KS Napoleon Mod 1.14. The 2-y russkoy armii na Zapade is slowly pushing west. French resistance has been steadily increasing. General Borozdin's 8-y Korpus has been tasked with securing the crossing over the Rio Jalon and taking control of the town of Alagon on the west side of the river. Cossack patrols report two divisions of French infantry in the vicinity of the town. Before being chased away by French light cavalry, they were able to approach close enough to see some of the enemy wearing bearskin hats. General Borozdin received this news with some satisfaction. It would seem that his supply of hats has reached a critical level. The campaign has been hard and Borozdin's habit of stomping his hat whenever the situation becomes critical has resulted in supply being unable to keep up with demand. In fact his staff are now all bareheaded, having had to sacrifice their own wear so the general's head can remained covered. A few bearskins may prove to be stylish replacements. 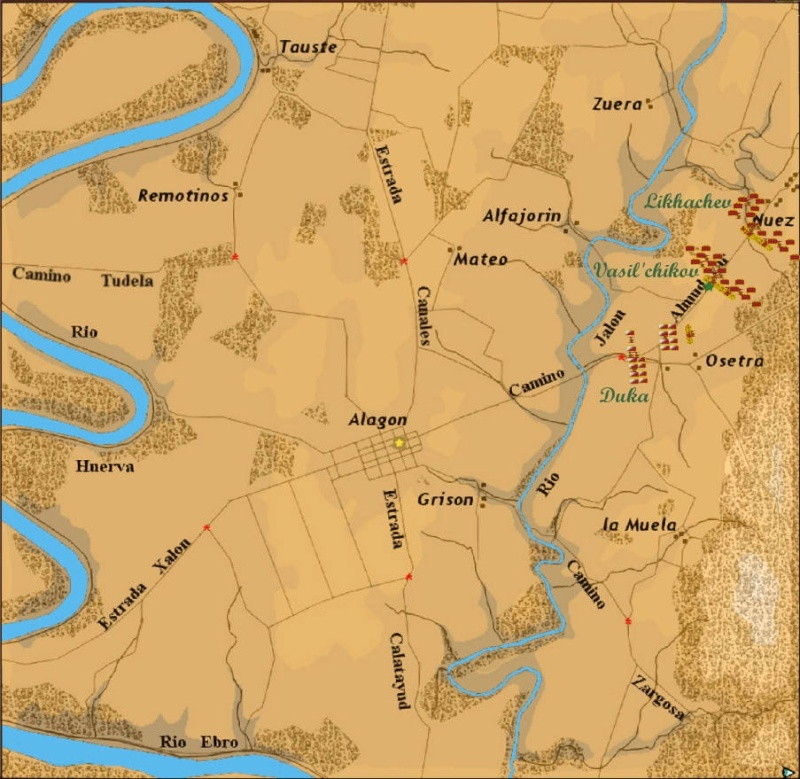 Objective: Secure the crossing of the Rio Jalon and capture the town of Alagon. Push all French troops as far away from the river as possible. Sounds like a fun battle. The river crossings on this map are always.... exciting. Put me down for a division please. I can't play tomorrow. It's a pity, a long time without leading Russian peasants.